Today, while enjoying one of Ireland’s few sunny days, I couldn’t help but notice a large advertisement on the back of a bus. 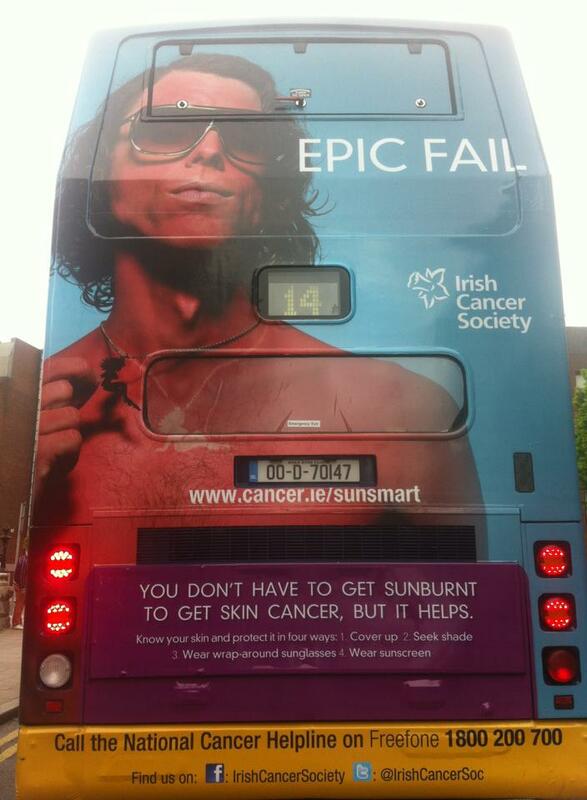 It was by the Irish Cancer Society, and presumably designed to inform people about the risks of skin cancer. Yet, I couldn’t help but feel offended. The advertisement is an insult to humanity. An insult to all affected by the disease, to all those who dedicate their lives to beating cancer. It’s an insult to the Irish Cancer Society. An insult to the long fought war on cancer, to all the fallen and those left behind. There’s nothing about this advertisement that is good. The insidious nature of the advertisement belittles our struggle. It trivialises the concern and makes it all into a joke, a punchline. I, like many others, expect these adverts to be withdrawn immediately. What is wrong with these people? What influences one to make such poor decisions? What drives such a decision? At what point did it seem like a good idea? Who thought this was necessary? What metric were you chasing? Who thought, “yes, send it to print”? Who thought? Nobody. Nobody thought about any of it. Look at how Cancer Research UK frames the issue at hand. Right from the offset, there’s no guilt. Cancer is the common enemy, and that we won’t be frightened by it. That we’ve succeeded before and that we’ll succeed again. I’m brought to tears every time I watch it. It’s so beautiful. “It’s cancers turn to be afraid.” That is art.